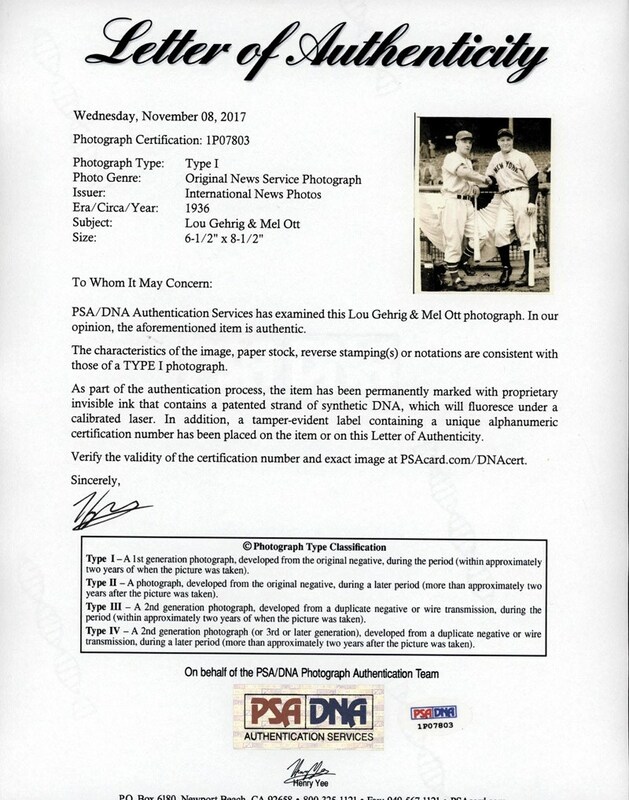 This outstanding 6-1/2" x 8-1/2" PSA Type I photo portrays two New York legends, Lou Gehrig and Mel Ott shaking hands before game#1 of the 1936 World Series. 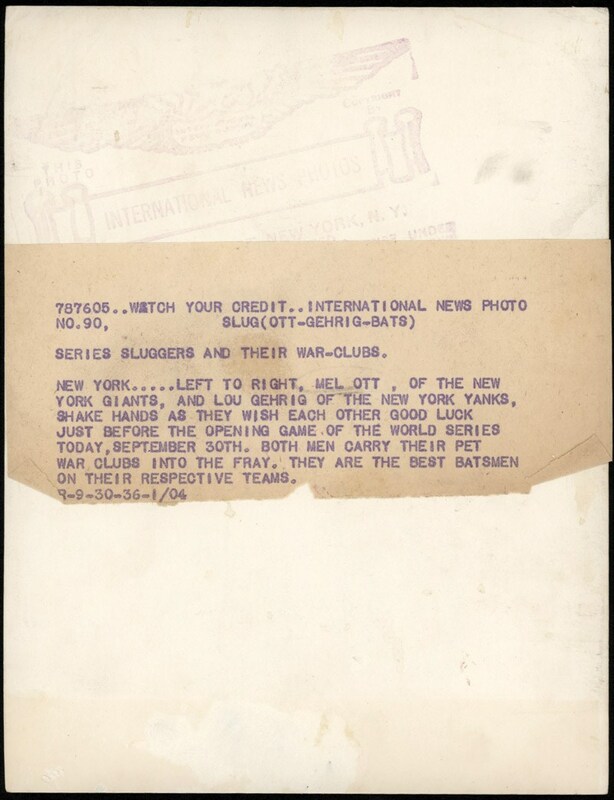 In 1936, baseball mania rippled through the city of New York with both the Yankees and Giants having clinched their respective pennants and ready to square off for a 13-year rematch of the 1923 World Series. In typical fashion, Lou Gehrig was the key Yankee force who along with sensational rookie Joe DiMaggio, helped lead the Yankees back to the top of their division. In the National League, the New York Giants would be led by their star left-handed slugger Mel Ott and southpaw hurler screwball master Carl Hubbell who ably assisted the Giants earning their second October fall fest in four years. No one would argue that these baseball giants were the key players for each team, with many photographers' significant focus on these two immortals eventually leading to this pre-game picture. Regarding the Iron Horse, his legendary feats require no introduction with his unparalleled wallops, string of 100+ R.B.I. seasons and legendary consecutive games played streak fully intact when this photo was taken at the Polo Grounds on September 30, 1936. Although the Giants would claim this Game 1 victory by a 6-1 score behind the superlative pitching of Carl Hubbell, the Yankees would ultimately win the championship by besting the Giants 4 games to 2. 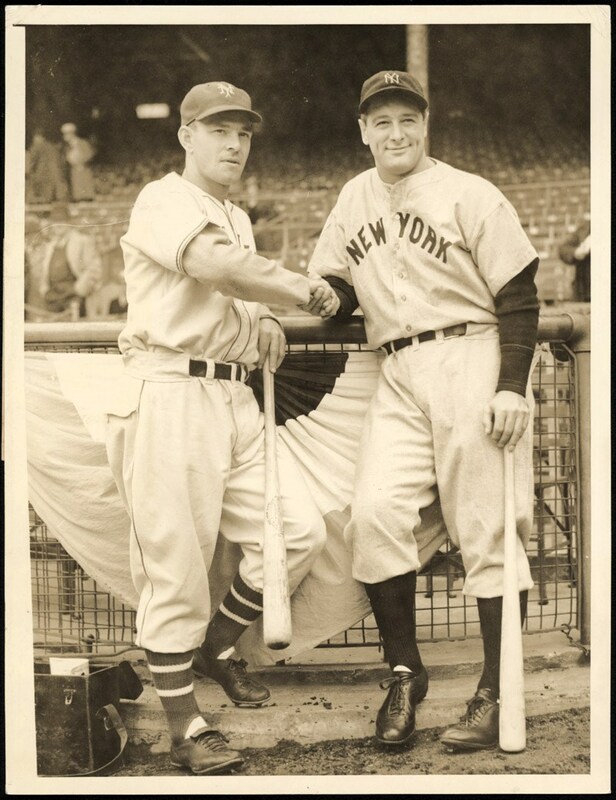 The Fall Classic would see Gehrig wallop two round-trippers and knock in 7 runs while Ott blasted a homer of his own and tallied 3 R.B.I. 's.